The Science Writers and Communicators of Canada is pleased to announce the winners of this year's book awards for books published in 2017. 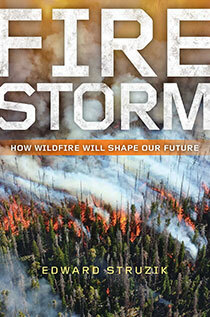 The winner in the general audience category is Firestorm: How Wildfire Will Shape Our Future by Edward Struzik. For two months in the spring of 2016, the world watched as wildfire ravaged the Canadian town of Fort McMurray. Firefighters named the fire “the Beast.” It acted like a mythical animal, alive with destructive energy, and they hoped never to see anything like it again. Yet it’s not a stretch to imagine we will all soon live in a world in which fires like the Beast are commonplace. A glance at international headlines shows a remarkable increase in higher temperatures, stronger winds, and drier lands– a trifecta for igniting wildfires like we’ve rarely seen before. This change is particularly noticeable in the northern forests of the United States and Canada. These forests require fire to maintain healthy ecosystems, but as the human population grows, and as changes in climate, animal and insect species, and disease cause further destabilization, wildfires have turned into a potentially uncontrollable threat to human lives and livelihoods. Our understanding of the role fire plays in healthy forests has come a long way in the past century. Despite this, we are not prepared to deal with an escalation of fire during periods of intense drought and shorter winters, earlier springs, potentially more lightning strikes and hotter summers. There is too much fuel on the ground, too many people and assets to protect, and no plan in place to deal with these challenges. In Firestorm, journalist Edward Struzik visits scorched earth from Alaska to Maine, and introduces the scientists, firefighters, and resource managers making the case for a radically different approach to managing wildfire in the 21st century. Wildfires can no longer be treated as avoidable events because the risk and dangers are becoming too great and costly. Struzik weaves a heart-pumping narrative of science, economics, politics, and human determination and points to the ways that we, and the wilder inhabitants of the forests around our cities and towns, might yet flourish in an age of growing megafires. Edward Struzikhas been writing about scientific and environmental issues for more than 30 years. A fellow at the Institute for Energy and Environmental Policy at Queen’s University in Kingston, Canada, his numerous accolades include the prestigious Atkinson Fellowship in Public Policy and the Sir Sandford Fleming Medal, awarded for outstanding contributions to the understanding of science. In 1996 he was awarded the Knight Science Journalism Fellowship and spent a year at Harvard and MIT researching environment, evolutionary biology, and politics with E.O. Wilson, Stephen Jay Gould and Richard Lewontin. His 2015 book, Future Arctic, focuses on the effects of climate change in the Canadian Arctic and the impacts they will have on rest of the world. His other books include Arctic Icons, The Big Thaw, and Northwest Passage. He is an active speaker and lecturer, and his work as a regular contributor to Yale Environment 360 covers topics such as the effects of climate change and fossil fuel extraction on northern ecosystems and their inhabitants. He is on the Board of Directors for the Canadian Arctic Resources Committee, a citizens’ organization dedicated to the long-term environmental and social well-being of northern Canada and its peoples. He lives in Edmonton, Alberta. If you want to buy the book, click here.